So sorry to read your plight. Hello all, been a long tine since my last post. Pt all summer, but knee just would not bend, could barley ride the stationary bike. Oct 2018 MRI showed 40% re tear. Dec 2017 consulted with a new surgeon, that revealed patella baja. Lots of PT I am now able to bend my knee to about 120-125 degrees. Very happy. Because my quad is still 40% torn, I have a 22 degree extension lag, and my knee buckles 5-6 times per day. I have to focus on every step I take. I have tried to resume normal everyday activities as much as possible. ( I am/was very active) but I still have trouble with uneven ground and downhill slopes. If I over do it, my knee will swell and I limp stiff legged for a few days. In my recent post op visits, we have been discussing a future quad revision surgery with an allograft sometime next year at the earliest. The surgeons believes that we could get within 5 degrees of full extension and correct the knee buckling. We have discussed the benefits and all of the risks. I am in my early 50s and I wonder if this is as good as it gets, or can I get better. I am in pain daily, stairs are a grind, but I an tackle them, be it slowly. So now I am trying to decide if I will benefit from going thru a 4th major surgery 5th overall. 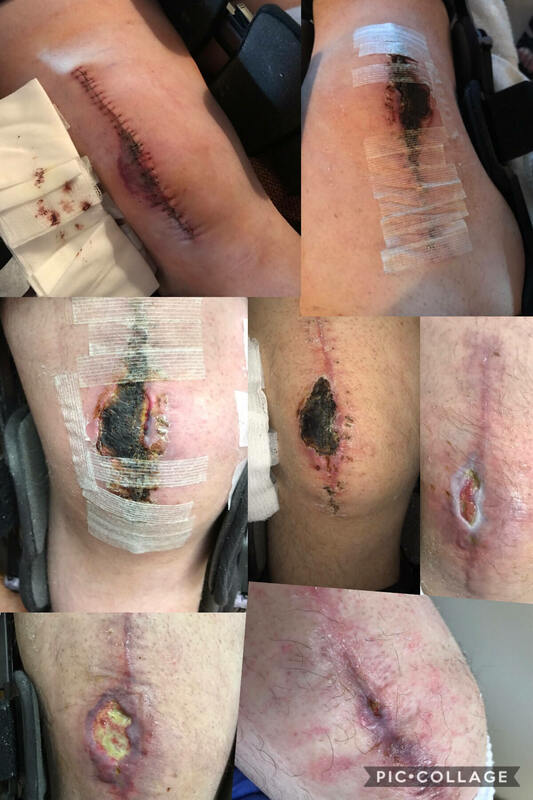 I know my situation is unique, but has anyone had success or difficulties having a revision surgery with a graft? Officially 2 years, 2 months out from surgery. With daily PT, and regular PT appointments much of my strength has returned, but I continue to have problems with certain things. I have given up the cane entirely as of 8/1 save for very windy days or rainy days. I have problems with hills and those yellow raised bumps in the ground for blind people. My walking however, is still another story as that has not yet returned to full 100% normal. I still can't run yet and PT has not cleared me for any travel away from home. However, I guess the good news is that I am down to going to PT once every three weeks now? I hope this is allowed, I started this FB group to interact and share our story, recovery, etc... I ruptured mine in August and re ruptured it again in October during therapy. Toughest thing I've ever dealt with. So far I'm 4 weeks post op and seems to be going well, but who knows, that's what I thought last time and it tore again without me even feeling it. Surgeon sent me for an MRI because my SLR had a good amount of lag and it was discovered. At last. PT is over. After approximately 22 months of PT, I have achieved approximately 80% of my normal strength, function, and ROM in my knee. My latest PT session on Tuesday 12/18/2018 is my last PT session...EVER. That just really sounds incredible when you think about it. Considering that I have been doing my PT exercises at home daily (on top of regular PT appointments) since 2/2017 to bring my knee back. There is still some work to do to get back to 100%, but at this point all PT is doing is telling me to do the exercises. Their reasoning is that I don't need them to just tell me to do the exercises (this is absolutely true). I walked around the extremely large PT centre the entire way using full weight on my quadriceps tendon like normal. Slightly slow of course (because I need to develop those regular walking habits again). But, man - I never thought I'd get here. I am so excited to be done with PT. 6 weeks ago I had a quad tendon revision with an allograft. It's too early to say I'm successful or not, I'm getting an mri in two weeks and will let you know what comes of it. I'll keep you posted. Kevin, I’m afraid a depression above the kneecap a finger’s breadth in width suggests a tendon rupture. Can you raise your lower leg whilst sitting? Please keep me posted. I am scheduled for the revision with an allograft the first week of March. Hi PEB65A. I am 13 weeks post op at this point and its a very slow go. I'm at 55 degrees active ROM and ambulating still with a cane, albeit with the brace off when indoors. I can do multiple SLR with about 3-4 degrees extension lag, I can probably get about 12 of em in a row before my quad gets tired. I had an MRI week 8 and the surgeon said that the repair looked good at that point. I am getting another MRI next week, not because he thinks something is wrong, just for peace of mind to make sure the repair is strong. Before the second rupture I had an extension lag of approximately 30-35 degrees when doing a SLR. The surgeon went through the patella with the sutures this time with the allograft, instead of using anchors like my first surgery. The anchors failed the first time. But if there is a silver lining and to answer your question, even though the recovery has been challenging and slow, it's still attached and I am progressing, albeit very slowly. Thanks for sharing. I have my appointment this week to go thru the details of the surgery. Not looking forward to it, but I am told there will be better results than where I am currently. I will post in a few days.